The PHRED instruments Micro DeadBolt gets its inspiration from Steve Cripe's Lightning Bolt, one of the iconic guitars played by Jerry Garcia in the 1990s. The body features a dual humbucker setup mounted in a custom pickup plate, with discrete split coil switches and a 3-way pickup toggle for 8 different tone combinations! Micro DeadBolt is professionally setup with low action and D'Addario 10-46 strings, and the frets are leveled and milled here at our shop in California for a nice smooth and clean feel all around. 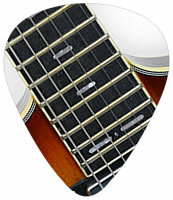 Micro DeadBolt has a 20.5" scale length and is tuned to Standard G tuning for best intonation with 10-46 gauge strings. So, rather than tuning to E A D G B E, DeadBolt Mini is tuned to G C F A# D G. Micro DeadBolt is the perfect guitar for young children learning to play electric guitar, and also as a travel guitar for adults. 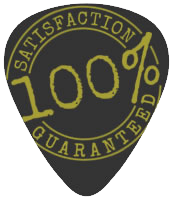 This sticker will be affixed to the guitar prior to shipping unless otherwise requested. Stickers are created by inlaystickers.com. The contoured body features a dual humbucker setup mounted in a custom pickup plate, with discrete split coil switches and a 3-way pickup toggle for 8 different tone combinations! There is one master volume and one tone knob, allowing you to dial in tone that goes from dark and muddy to crisp and bright. 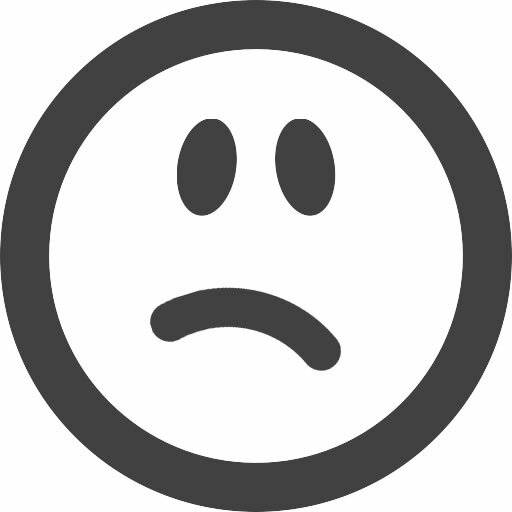 There is one 1/4" output jack on the top of the body for a standard guitar cable to plug into an amplifier. 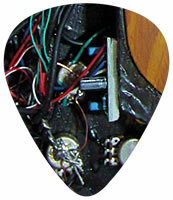 On the back of the guitar, there is a large and accessible electronics cavity. 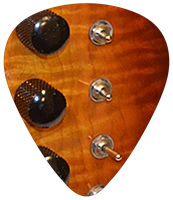 The maple core neck is attached to the body using 4 screws. The back of the neck contour is a C-shape that feels somewhere in between a strat and an LP neck, not too thin, and not too chunky either. The 22-fret ebony fingerboard has medium jumbo frets which are leveled and milled here at our shop in California for a nice smooth feel along the edge of the fretboard. 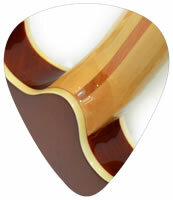 The fretboard features a 12 inch radius which is perfect for soloing and playing chords up and down the fretboard. Topping off the fretboard are dot inlays for finding your place along the guitar neck. At the top of the neck, you'll find a bone nut for good sustain, and white binding all around the fingerboard for a clean look and feel. The tilt-back 3+3 headstock shape is inspired by Cripe's headstock with some visual design changes. 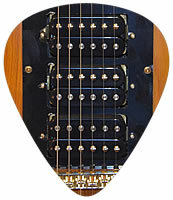 Under the fretboard is the adjustable double-expanding truss rod, keeping the neck stable in any climate. The PHRED instruments Project Gator gets its inspiration from a classic guitar design, and one of the iconic guitars played by Jerry Garcia. The body features a triple single coil setup with a 5-way pickup toggle, main volume, main tone, and a blaster knob. Project Gator is professionally setup with low action and D'Addario 10-46 strings, and the frets are leveled and milled here at our shop in California for a nice smooth and clean feel all around. Scroll down to the full description and specs for more information.